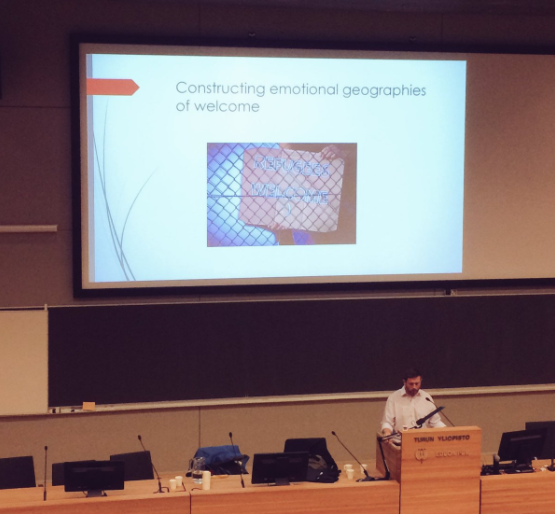 In a fascinating keynote lecture, Prof. Nick Gill spoke about the Emotional Geographies of Welcome at the The Annual Meeting of Finnish Geographers at the University of Turku (https://maantieteenpaivat2017.wordpress.com/kutsuvieraslue…/) on 26 Octover 2017. Welcome has increased in social and cultural prominence in recent years but has received relatively little critical social scientific attention. This paper begins by exploring the concept of welcome with respect to hospitality and sanctuary, seeking to distinguish and clarify the term. It goes on to reflect on the ways in which this has been overshadowed by a variety of social developments. The paper therefore calls for both a cultural and political reclamation of welcome as a form of everyday solidarity. It advocates for attention to be paid to both the creative, reciprocal affectivities of welcome and its tactical and pedagogic value. With reference to recent struggles around migration and colonialism globally, the paper sketches out the potential of rethinking welcome in the current era.